It is rare that you see a young-adult novel that is simply about people. Even if this kind of novel does make it's way into the dystopian-fantasy-dominated YA shelves, it is usually pushed to the side to make way for fantasy books like Matched, Uglies, and Twilight. (Don't get me wrong, these are good books, too. They are just catering more to what teens want, instead of branching out.) 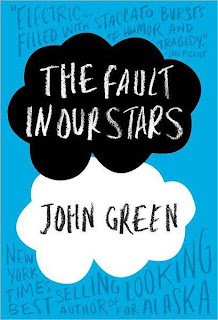 So I was surprised to see the round yellow sticker on the front of The Fault in Our Stars, (Dutton Books, 2012) announcing that this book was a #1 New York Times Bestseller. It didn't have a flashy picture on the cover--instead, two simple clouds announced the title and author. But what was inside was pure gold. This novel is about a girl named Hazel Grace Lancaster, diagnosed at the age of thirteen with a thyroid cancer that spread to her lungs. She is hooked up to an oxygen tank almost all of the time that helps her breathe. Then she meets Augustus Waters, who lost his leg to osteosarcoma. They befriend each other and soon fall in love, before everything falls apart. "As the seats around the gate began to fill, Augustus said, "I'm gonna get a hamburger before we leave. Can I get you anything?" "No," I said, 'but I really appreciate your refusal to give in to breakfasty social conventions." He tilted his head at me, confused. "Hazel has developed an issue with the ghettoization of scrambled eggs," Mom said. "It's embarrassing that we all just walk through life blindly accepting that scrambled eggs are fundamentally associated with mornings." " I want to talk about this more," Augustus said. "But I am starving. I'll be right back." These little bits and pieces are what make this novel perfectly human. It shows all sides of people, love, happiness, "corny-ness", heartbreak, and utter sorrow. We all experience this in ways that only a simply human person can. And so, I close this with one simple message. Humans, however much they don't care to admit it, will always relate more to a normal, not particularly special character than some fantastical creature. And that is why The Fault in Our Stars is so successful. It is a book with a simple yet powerful message about what goes on between humans.